My favorite word is constantly changing. When I find one I like better, it becomes my new favorite. Currently, my favorite word is happy. It’s short, simple and to the point. I love how there are so many meanings, happy can mean being fortunate, delighted or content. There are many synonyms, but sometimes ‘happy’ is the only way to explain something. I also like how happiness can come from the smallest things, like someone smiling at you in the hallway or a simple compliment. It’s the kind of emotion that everyone should experience. In addition, happy is one of the first emotions you learn as a child, so I feel like I know it the best. I always know when I’m happy and when I’m not, but when it comes to other emotions, I never know where I stand. For some reason, when I think of the word happy, I always see bumblebees, flowers and the color yellow. 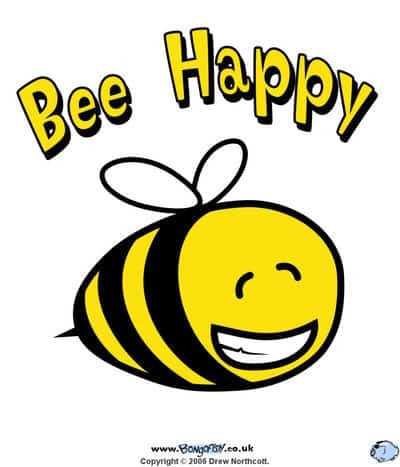 I think it’s because the word happy is usually surrounded by yellow flowers and bee graphics. Which I think is a little ironic because bees are usually thought of as harmful for their stinging. Nevertheless, seeing the color yellow always seems to brighten my day. Bee Happy by Chloe is licensed under a Creative Commons Attribution-ShareAlike 4.0 International License. This post made me happy! I enjoyed seeing something so positive today. I loved how you took something so simple and made it even more meaningful by explaining what happiness means to you. My favorite sentence was, “There are many synonyms, but sometimes ‘happy’ is the only way to explain something.” Everyone finds happiness in different ways, but it is something each and every one of us has experienced, which makes it a very unifying quality. We are all on the pursuit for happiness, and like you said, it’s an emotion we should all experience. Thank you for your post! One sentence you wrote that stand out to me is when you said “happy is short, simple, and it get’s to the point. You didn’t take forever to tell us why you like the word happy, you just got straight to the point.